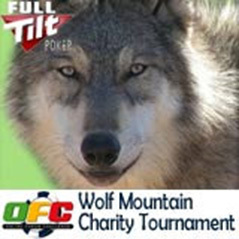 Saturday, December 5, marks the day that Full Tilt Poker will play host to the Online Forum Challenge Wolf Mountain Sanctuary charity tournament at 8pm GMT. The tournament is an $11 entry that will raise money for Wolf Mountain Sanctuary, a non-profit animal organisation, in association with Online Forum Challenge. The best players in the tournament will be given prizes from the ALL IN clothing company as well as a one-year premium membership to the Poker Players’ Alliance. Full Tilt will also provide prizes.